Spring is peeking through here in Nashville. Jacki, Tai and I have been catching glimpses on our walks. It makes us happy, this time of rebirth. A rejuvenation that sinks into the bones and brings about the excitement to begin, continue, finish....everything. Where we left off. The dreams that have been simmering, the need to create...and to just be. 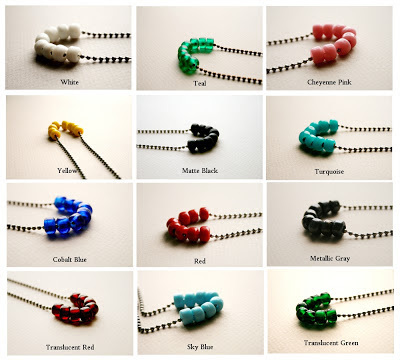 In celebration of the times, I've made the Crow necklaces, vibrant in their hues. Like the flowers that are making their appearance right now. Crow beads have a long history in the different Native American cultures, beginning with the beads being traded to Native Americans for wares. They used them for jewelry, clothing, and many other things in their day to day lives. I've used them here simply on ball chain to add bits of brightness and color to your day. I love mine. They're perfect for layering with other necklaces or with each other. You can find them here in their own special section in the Etsy store. It's early afternoon here in my little studio in Tennessee, and I'm listening to this lady croon while I type this....Soon to pick up my torch and begin with fire and metal. I hope your Wednesday is lovely and that the first glimpses of spring are thrilling you like they are me. It's lovely to see you too, MLJ! It's like a slow, gradual opening of spring right now...looking forward to the burst though. I'm headed over to see you and those sweet cats right now!